In March of 1925 congress authorized the Mount Rushmore Memorial Commission. The idea of Mount Rushmore was first thought of by Doane Robinson to bring more tourists to South Dakota. Robinson convinced sculptor Gutzon Borglum to travel to the black hills to guarantee the accomplishment of the carving. 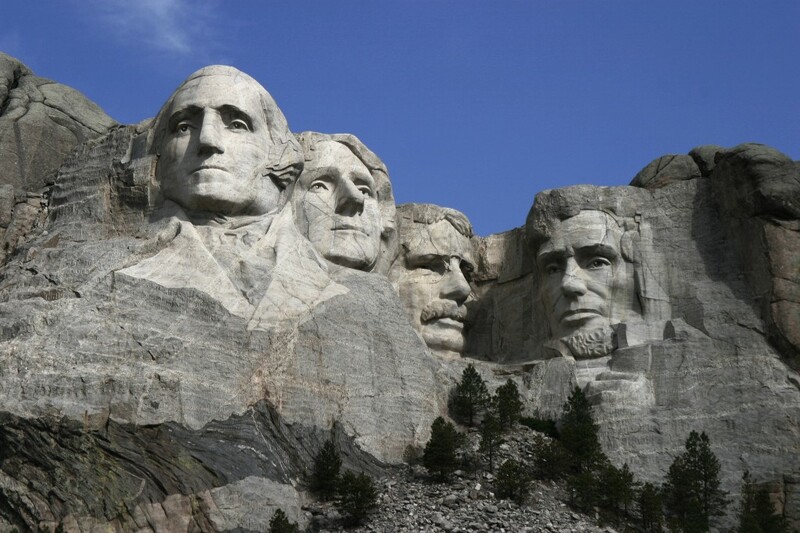 Between 1927 and 1941 Borglum, 400 workers, and lots of dynamite were able to sculpt the gigantic 60 foot carving of U.S. Presidents George Washington, Tomas Jefferson, Theodore Roosevelt, and Abraham Lincoln. The Propose of the monument was to represent the first 150years of American History. United States president Calvin Coolidge demanded that two Republicans and one democrat be portrayed with George Washington. However it was Gutzon Borglum who selected the other presidents. George Washington’s face had been completed and was dedicated by July 4, 1934. Tomas Jefferson’s face had been accomplished and dedicated in 1936. By September 17, 1937 Abraham Lincoln’s face had been completed and dedicated. In 1937 a bill was introduced in congress to add the head of civil-rights leader Susan B. Anthony. However it did not pass due to funds only allowing the heads that had been started to be finished. By 1939, the face of Theodore Roosevelt was dedicated. Gutzon Borglum died in 1941. His son Lincoln Borglum carried on with the project. It was originally planned that the faces be carved from head to waist. Due to insufficient funding the sculpture was forced to come to an end. The project cost the U.S. $989,992.32. Today that number would calculate to $12,135,666.71. No workers died during the project. Mount Rushmore was listed on the National Register of Historic Places on October 15, 1966. In 1991 President George H.W. Bush officially dedicated Mount Rushmore. Mount Rushmore is controversial among the Native Americans because the U.S. seized the area from the Lakota Tribe after the great Sioux war of 1876. “Mount Crazy Horse” is now being sculpted to commemorate the famous Native American leader and as a response to Mount Rushmore. Mount Rushmore is a great monument and a great symbol of the United States.